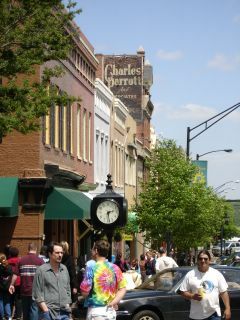 Another view down Broad Street from College St. -- on another sunny gorgeous April day in Athens. We were downtown to watch Emma sing with the Athens Montessori Singers at the Human Rights Festival this past Saturday, April 23. They were terrific and enthusiastic as usual. Then we headed off to The Globe for hamburgers for a late lunch. We ended the day by going to a celebration of National Dance Week at the Athens Public Library. Some of the older students from the Athens School of Ballet (where Emma takes classes) did some ballet and modern dances and we watched a PBS documentary called "Born to Be Wild" about the four leading men of the American Ballet Theatre. Wow, there is so much to do in Athens -- especially in the Spring -- come visit!